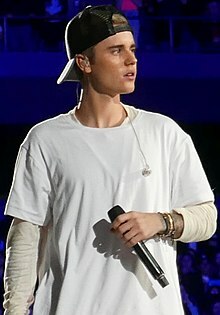 Justin Drew Bieber (teraka tamin'ny 1 martsa, 1994) dia mpihira pop-R&B kanadianina. ↑ Greenblatt, Leah (March 10, 2010). "My World 2.0 (2010)". Entertainment Weekly (Time). http://www.ew.com/ew/article/0,,20350064,00.html?xid=rss-music-reviews-My+World+2.0. Retrieved June 11, 2010. ↑ inogolo:how to pronounce Justin Bieber. Voaova farany tamin'ny 5 Aogositra 2016 amin'ny 18:13 ity pejy ity.